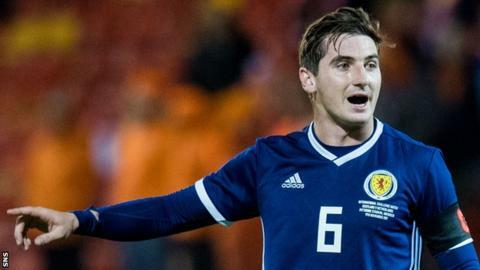 Kenny McLean says Scotland's touring players have an opportunity to catch the eye of boss Alex McLeish for competitive fixtures to come. The Scots travel to face Peru on 30 May, then Mexico four days later. Midfielder McLean, 26, has three caps and is part of an inexperienced squad that will provide the final warm-up friendlies for each opponent before they head to the World Cup finals. "There are a lot of young boys in the squad," Norwich City's McLean said. "You have [former Scotland captain] Scott Brown recently retired so you have places up for grabs. "The manager seems to be looking to the future with the squad he is putting together. "There are a lot of young boys there like Lewis Morgan but even the last squads you had players like Jason Cummings and Oli McBurnie, so there is plenty of youth there and if I can keep being involved in that then it is always going to benefit me." Scotland host Albania on 10 September, and tackle Israel away a month later in their inaugural Nations League campaign. McLean helped Aberdeen to second place in the Scottish Premiership for the fourth season running in his final year at Pittodrie. He signed for Norwich in January but was loaned back to the Dons for the rest of the season. Before featuring for his new club, the former St Mirren player is relishing the opportunity to run out at the historic Azteca Stadium in Mexico City. The Scots face Peru in front of a sell-out 45,000 at the national stadium in Lima, before moving on to the Mexican capital where the famous 87,000-capacity arena will be packed to give the hosts a send off. The Azteca is the first stadium to have hosted two World Cup finals, Brazil's 4-1 defeat of Italy in 1970 when Pele starred and Argentina's 3-2 victory over West Germany in 1986, after Diego Maradona's 'Hand of God' goal had helped the South Americans beat England in the quarter-finals at the same venue. "You want to be involved in massive games in big stadiums," McLean added. "To get the chance to represent your country in such an iconic stadium against a team which will have fans right behind them is a huge honour. "There is not much bigger than playing in the Azteca. It will be a great game to be involved in if I get the chance and hopefully I do. "It will be the biggest crowd by far that we have played in front of. Obviously, [Celtic Park] is the biggest we will get in Scotland so playing in those kind of arenas is excellent for everyone that will be involved. "It is two massive internationals. With both sides going to the World Cup shortly after, their fans will be right up for it and I am sure their players will be massively up for it."